What's the benefit of attending this convocation? Convocation is a big day. It's the event for celebrating the graduation ceremony of students for their hard work as a recognition of the award of degree parchments to students. This is a day which comes once in a lifetime for every graduate. Hence, to make it memorable it is advisable for all graduating students to attend this session. How can I register for the convocation? Registration will be done on site at the Main campus from the 5th January 2017 to 31st January 2017. Where to collect the convocation gowns? Please collect your Gown and cap from the main campus of the University 2-3 days prior in the convocation. Notification will be available in our website convocation.wub.edu.bd. When and how to return the convocation gowns? Gowns and caps should be returned to the main campus on 13th and 14th March 2017. Gowns submitted later will incur a cost of Tk. 500 for each day deferred. Where will the convocation be held? Convocation will be held Bangabandhu International Conference Center ( BICC) , Agargaon, Sher-E.-Bangla nagar, Dhaka-1207, Bangladesh. Will there be any rehearsal for the convocation? A rehearsal is mandatory for Convocation Event. Details of timings will be available in this website. 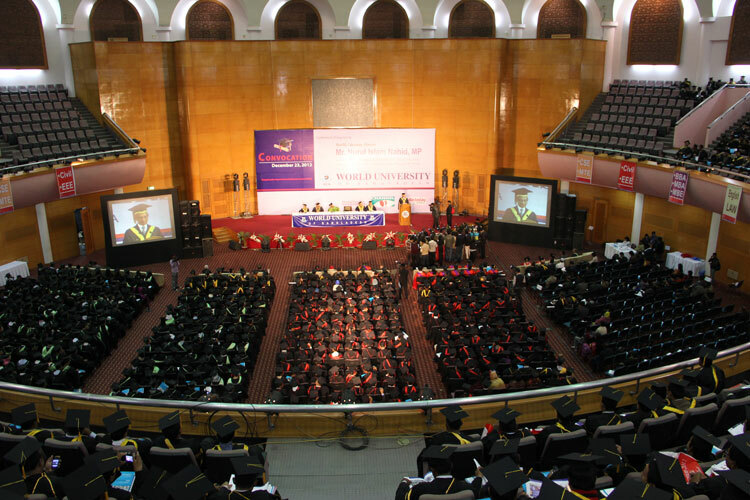 What security measures should a student comply when attending such a convocation? Cell phones, pens, cameras and any form of electronic devices are strictly prohibited in such events. Please only carry your invitation cards and ID documents (if provided) to the event. Am I allowed to bring parents or guests? You are allowed to bring one guest which could be a parent or a guardian. How to collect the convocation pictures? Our photographer will be assigned for delivery of the pictures shot during the convocations. A flickr link will be available in this website from which you can choose your pic and pay the requisite fees for collection at the Division of Student Affairs. If I do not attend the convocation, what can be done? In essence, when a convocation is observed by a University, the provisional certifications so far distributed to students becomes invalid. In order to comply with obtaining a validated certification, all students must now communicate with the Office of the Controller of Examinations and obtain the final certification. Obtaining a final certification is essential as it ensures that your credentials so far earned is recognized and approved to all employers and agencies. The time to take their seats is by 9.45 am. No entry for students will be made after this period. Persons to participate in the Convocation Ceremony of the 2017 must carry their respective invitation card; this is not transferrable. Seat arrangements have been made Faculty / Department wise. Participants have to take their seats accordingly. The doors of the Auditorium will be closed before Convocation procession begins. Everyone has to show due respect by standing when the procession of the Hon’ble Chancellor enters the Convocation Hall. Everyone has to maintain discipline as long as the Convocation Ceremony continues. The use of mobile phones or any cameras is strictly prohibited. Graduates have to stand silently while the Hon’ble Chancellor confers the degree. After being conferred the degree the ribbon on top of the Hood should be moved from the left side to the right side.